By default, the dialog is modal. A modal window blocks the user interface, and does not allow the user to interact with any other part of the user interface until the dialog is closed (this is enforced at the server side, so you may rely on this behavior). A modal dialog can be instantiated synchronously or asynchronously. A non-modal dialog can only be instantiated asynchronously. When using a dialog asynchronously, there is no API call that waits for the dialog to be closed. Then, the usage is similar to instantiating any other widget. The dialog may be closed by calling accept(), reject() or done() (or connecting a signal to one of these methods). This will hide the dialog and emit the finished() signal, which you then can listen for to process the dialog result and delete the dialog. Unlike other widgets, a dialog does not need to be added to a parent widget, but is hidden by default. You must use the method show() or setHidden(false) to show the dialog. The synchronous use of a dialog involves a call to exec() which will block (suspend the thread) until the dialog window is closed, and return the dialog result. 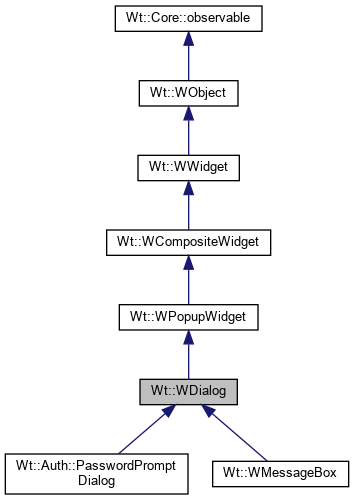 Events within dialog are handled using a so-called recursive event loop. Typically, an OK button will be connected to accept(), and in some cases a StandardButton::Cancel button to reject(). This solution has the drawback that it is not scalable to many concurrent sessions, since for every session with a recursive event loop, a thread is locked until exec() returns. A thread that is locked by a recursive event loop cannot be used to process requests from another sessions. When all threads in the threadpool are locked in recursive event loops, the server will be unresponsive to requests from any other session. In practical terms, this means you must not use exec(), unless your application will never be used by more concurrent users than the amount of threads in your threadpool (like on some intranets or extranets). Using exec() is not supported from outside the regular event loop (i.e. when taking a lock on a session using WApplication::getUpdateLock() or by posting an event using WServer::post()). Use setModal(false) to create a non-modal dialog. A non-modal dialog does not block the underlying user interface: the user must not first deal with the dialog before interacting with the rest of the user interface. Contents for the dialog is defined by adding it to the contents() widget. For the dialog (or rather, the silkscreen covering the user interface below) to render properly in IE, the "html body" margin is set to 0 (if it wasn't already). Unlike other widgets, the dialog does not require a parent container since it is a top-level widget. Constructs a dialog with a given window title. Closes the dialog, with result is Accepted. Returns the dialog contents container. Content to the dialog window may be added to this container widget. Sets the dialog result, and emits the finished() signal. If a recursive event loop was started using the exec() method, it is ended. Executes the dialog in a recursive event loop. Executes the dialog synchronously. This blocks the current thread of execution until one of done(DialogCode), accept() or reject() is called. Icon::Warning: using exec() does not scale to many concurrent sessions, since the thread is locked until exec returns, so the entire server will be unresponsive when the thread pool is exhausted. Signal emitted when the dialog is closed. Returns the dialog footer container. This is an optional section which is typically used for buttons. Returns whether the title bar is enabled. Returns whether the dialog can be moved. Signal emitted when the dialog is being moved by the user. The information passed are the new x and y position (relative to the wietdow). Positions a widget next to another widget. Positions this absolutely positioned widget next to another widget. Both widgets must be visible (including all their ancestors). The current widget is shown automatically if needed. When orientation = Wt::Orientation::Vertical, the widget is displayed below the other widget (or above in case there is not enough room below). It is aligned so that the left edges align (or the right edges if there is not enough room to the right). Conversely, when orientation = Wt::Orientation::Horizontal, the widget is displayed to the right of the other widget (or to the left in case there is not enough room to the right). It is aligned so that the top edges align (or the bottom edges if there is not enough room below). Closes the dialog, with result is Rejected. Lets pressing the escape key reject the dialog. Before Wt 3.1.5, pressing escape automatically rejected the dialog. Since 3.1.4 this behaviour is no longer the default since it may interfere with other functionality in the dialog. Use this method to enable this behaviour. Returns whether the dialog has a resize handle. Signal emitted when the dialog is being resized by the user. The information passed are the new width and height. Returns the result that was set for this dialog. Set focus on the first widget in the dialog. Autofocus is enabled by default. If a widget inside of this dialog already has focus, the focus will not be changed. Adds a close button to the titlebar. The close button is shown in the title bar. Clicking the close button will reject the dialog. The default the maximum width and height are WLength::Auto, indicating no maximum size. A LengthUnit::Percentage size should not be used, as this is (in virtually all cases) undefined behaviour. The default minimum width and height is 0. The special value WLength::Auto indicates that the initial width is used as minimum size. A LengthUnit::Percentage size should not be used, as this is (in virtually all cases) undefined behaviour. Sets whether the dialog is modal. A modal dialog will block the underlying user interface. A modal dialog can be shown synchronously or asynchronously. A non-modal dialog can only be shown asynchronously. By default a dialog is modal. Allows the dialog to be moved. The dialog can be moved by grabbing the titlebar. Adds a resize handle to the dialog. The resize handle is shown in the bottom right corner of the dialog, and allows the user to resize the dialog (but not smaller than the content allows). This also sets the minimum width and height to WLength::Auto to use the initial width and height as minimum sizes. You may want to provide other values for minimum width and height to allow the dialog to be reduced in size. Enables or disables the title bar. The titlebar is enabled by default. Sets the dialog window title. The window title is displayed in the title bar. Returns the dialog title bar container. The title bar contains a single text that contains the caption. You may customize the title bar by for example adding other content. Returns the dialog window title.